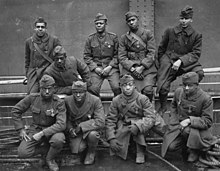 By the end of the 369th Infantry's campaign in World War, I they were present in the Champagne – Marne, Meuse – Argonne, Champagne 1918, Alsace 1918 campaigns in which they suffered between 1,500 casualties, the highest of any U.S. regiment. In addition, the unit was plagued by acute discipline problems resulting from disproportionate casualties among the unit’s longest-serving members and related failures to assimilate new soldiers. The 369th also fought in distinguished battles such as Belleau Wood and Chateau-Thierry. ^ Dvorak, Petula (18 April 2019). "This soldier was a 'hero among heroes.' So why was he denied a Medal of Honor?". Washington Post. Retrieved 19 April 2019. This page was last edited on 22 April 2019, at 13:40 (UTC).